Book Two in the series by our very own Dana Burkey, VIP Ambassador! Get your Spirit Athlete involved in a book series just for them! 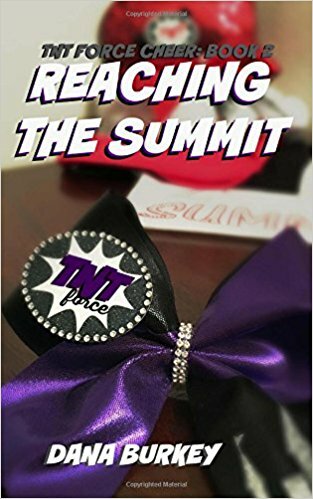 (Book Three was included in our March 2017 Teen Edition) Limited copies available TNT Force is one of the top ranked all star cheerleading gyms in North Texas, and for Max Turner it is a place she never thought she would call home. After a rough start to her cheerleading career, she is finally fitting in and enjoying her time practice at the gym, as well as her time performing on Blast, the gyms junior level 3 team. But, the farther into the competition season they get, Max and the other ladies of Blast are starting to falter in their elite level cheerleading. With stunts not staying in the air, tumbling passes not hitting the mark, and competition after competition going by without a first place win, Max is beginning to get overwhelmed by her competitive spirit. Is staying on a losing team with her friends worth the constant defeat? Can her team rise to the occasion and actually win? With Summit, a massive international cheerleading competition, less than a month away, Max has a big decision to make. Knowing that her team is fighting to even compete at a basic level, is it time for Max to leave the gym and go back to playing the sports she enjoyed before she began cheer? With her friends, team, and cheerleading career hanging in the balance, follow Max as she navigates through big decisions and changes that could forever affect her place at the TNT Force gym.